Café Abseits: Guest Beer policy. "Cafe Abseits (Podeldorfer Str.) a studenty bar, was a revelation though. Informed, intelligent and friendly staff (unafraid to use English) and a GUEST BEER policy. Rather like the excellent Cask on Liverpool Road, Manchester they have a months residency of a guest brewery, running through their draught range and stocking all the bottled beers. Helpfully they give details on the web as well! It seems they specialise in stuff from inaccessible Franconian breweries too." 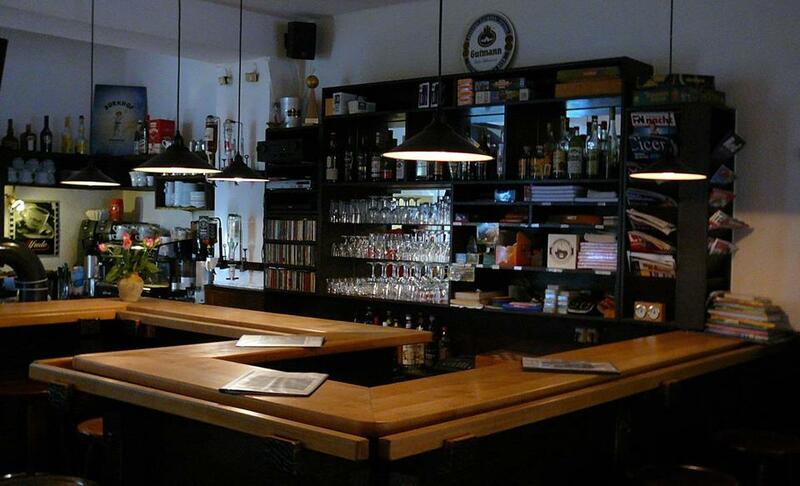 "Specialist beer bars are a bit of a rarity in Germany. It's unusual to find somehere with more than half a dozen different beers and bars tend to stick to the products of a single brewery. Abseits is an exception, proudly styling itself as Bamberg's Ältestes Studentencafé & Bierspezialausschank (Oldest student café and special beer pub). It offers a constantly changing selection of draught beers, beers from most of the Bamberg breweries and other Franconian classics. Some examples are: Hartmann, Brauerei Sauer of Rossdorf and Brauerei Zehendner in Mönchsambach (their kellerbier is a knockout). Passing on to a physical description of the establishment, it's a simple modern cafe bar in a pink-painted 19th century building, located behind the station. It has white painted walls very sparsely adorned with pictures and very low-kew wooden furniture. There is a beer garden at the rear."